Randy Crader, 29, remembers being gathered around the TV with his college roommates in 2009 when the Dow Jones fell below 7,000. "All of us were looking around at each other and saying, 'We aren’t getting jobs when we graduate,'” said Crader. 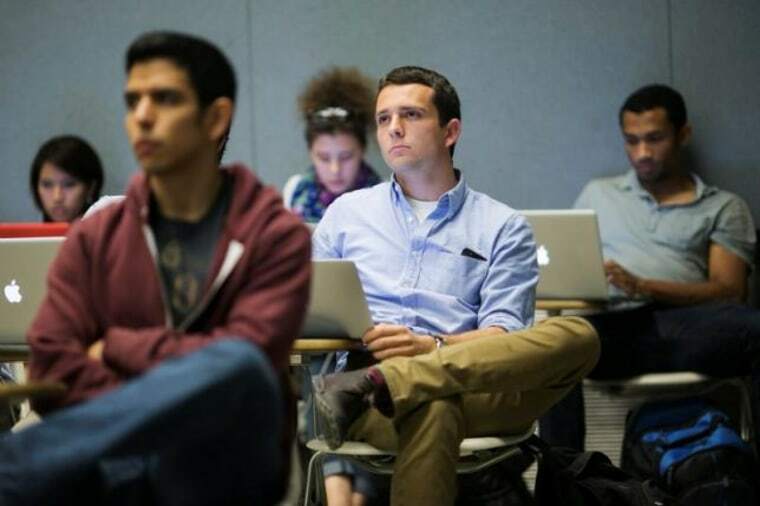 "During my entire college career we constantly heard about the economy worsening and failing, and that we shouldn’t expect to be hired upon graduation; that it would only be some of [us]." Now a senior account executive at Paul Werth Associates, Crader obviously didn't face the worst-case scenario of never finding a decent job, but the anxiety stirred by the Great Recession left a permanent mark on young minds. "We became so conditioned to thinking the economy is constantly in a state of disarray that the mindset still hasn’t left," Crader said. It’s a mindset that many millennials can relate to — and it’s affecting how they shop. Or more precisely, how they don’t shop. 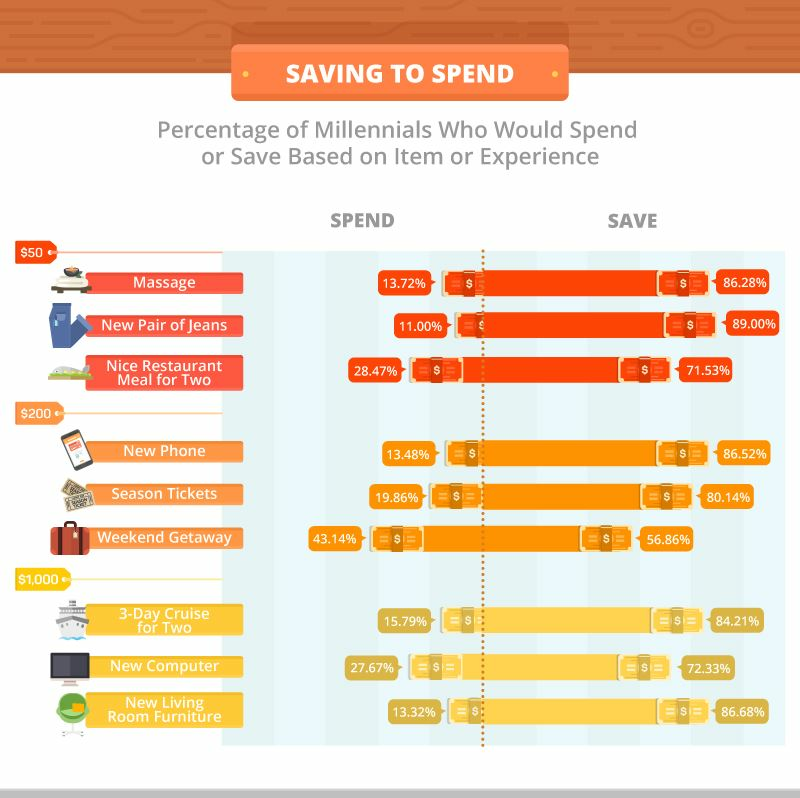 A new survey by LendingTree consulted 2,000 adults (48 percent were millennials, aged 25-34), and found that 89 percent of millennials would rather save $50 than spend it on a pair of jeans; over 86 percent would rather save than get a massage, and nearly 72 percent would opt to save rather than eat out with a friend/partner. What millennials are saving for varies: nearly 15 percent say they're growing an emergency fund, while 12.5 percent say they’re saving for a house or apartment, with nearly 9 percent pinching pennies for a vacation. More than six percent say they're saving for retirement. Everyone knows that saving for retirement is necessary, but perhaps no generation is so keenly acting on this knowledge as millennials, who not only started their careers during or in the wake of a historic financial crisis, but may have also watched their boomer parents struggle with debt. "[Millennials’] parents struggle in 'sandwich generation' situations, where many seniors can’t care for themselves financially so they’ve become the burden of their adult children who are still parenting their own children — adult and minor," said April Masini, relationship expert and author. "Millennials see what their parents are going through and want something different for themselves, so they save." Already consciously saving funds is 23-year-old Kayla Hockman. "Seeing my mother in debt now and struggling when I was growing up was really difficult," said Hockman, who works in communications. "I always promised myself that when I grew up, I’d save my money so I wasn’t in the same boat down the road." Meanwhile, other millennials are battling their own staggering debt. "Me and my husband are working our way out of about $98,000 in debt (about half in student loans), and we have very little savings to speak of," said Lindsay VanSomeren, who started the blog, Notorious D.E.B.T. to reach out to millennials in similar situations. "I'd much rather save than spend because we are not on firm financial footing," added VanSomeren. "One major illness, and we'll lose all of our money and be out on the street." What is a "real and authentic experience?" For many millennials, it involves traveling. In addition to the nearly 9 percent of millennials who told LendingTree that they're saving for a vacay, more than six percent claimed to be saving for travel abroad. "More than any other generation before them, millennials are seeing friends [on social media] going out and having adventures,” said Eric Snapper, project manager, LendingTree. “Instagram has created a certain wanderlust that influences decisions and how they spend their money,"
Once they've saved up the money to travel, millennials aren't about to squander it on a less than ideal experience, which means that travel brands have to step up their game in meeting millennial needs. “[Millennials] have pushed boundaries on work/life balance, and they travel — a lot," said Claire Bennett, executive vice president of American Express Travel. “Our data reveals that millennials, in comparison to the boomer market, are more optimistic in their travel patterns, place experience over product, plan to travel more frequently and will spend more on travel within the next five years; which will have a tremendously positive impact on the future of the travel industry at large" said Bennett. "And one thing is certainly clear: people, regardless of their age and the cost of travel, place a high value on personalized service in their travel experience,” she added. Marketing at millennial values (including their penchant for travel and adventure) can help clothing retailers and others that may be missing out on millennial consumers. After all, it's not as though millennials don't buy clothes; they just generally don't buy them without weighing priorities. Understanding those priorities can go a long way for brands. "Many millennials are interested in a lifestyle that allows them the flexibility to travel, and with the uncertainty surrounding where money will be come from in the future, it's a lot easier to buy less-expensive jeans and use the money we've saved for adventuring," said April Klimkiewicz, a millennial and the owner of Bliss Evolution, a career coaching business. "I think retailers are aware of this and are selling the feelings or emotions attached to certain clothes, rather than the clothes themselves," said Klimkiewicz. "Urban Outfitters, for example, uses beach, forest, and mountainous landscapes to evoke that feeling of adventure in their advertisements; selling the ability to adventure in [Urban Outfitters] clothes, rather than the clothes themselves." "Millennials would rather have a lot of variety of cheaper pieces of fashionable clothing that may not be designer, than a few pieces of expensive 'brand-name' jeans," said Alexis Sheehy, founder of Shopnym. "A response to this would be to increase the number of flash sales. One-day opportunities you can push online via email marketing and social media campaigns, promoting a temporary sale opportunity." And yes, please do use social media as often as you can to tout products and discounts — take a quick course in social media marketing if you must. "I had to once explain what Twitter was to a major brand founder during a presentation last year. A lot of people don't get it," said Sheehy.